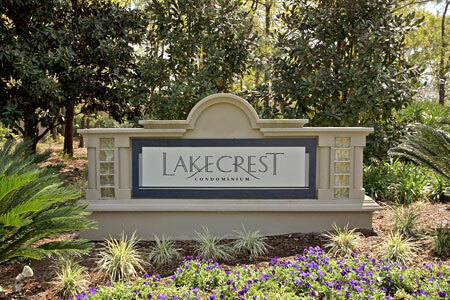 Lakecrest condominiums in Jacksonville, Florida. Lakecrest is the 294-unit, condominium community offering stylish homes comfortably set amongst tranquil lakes and cascading fountains in Jacksonville's popular and prestigious Southside community. Here you'll find more than a carefree lifestyle, you'll find more room for living. It's easy, inside or out, work or play. It's all within reach at Lakecrest. Crosswind Communities acquired the property in October 2004 and start converting them into stunning luxury condominiums. See sitemap. Lakecrest offers four ample floorplans from 914 square feet to 1,376 square feet, each with creative design elements and plenty of flexible space. Each condominium homes with private garages and entries. Choose from: The Cascades, The Waterfield, The Fountains, and The Lakeside. Lakecrest homes are arranged in small clusters, partially enclosing the front entrances with large private balcony offering picturesque nature, lake or pool views, making the community a must-see for residents looking for a quiet, personal retreat. Homeowners also enjoy elegant interior amenities, including 11- foot ceilings in select homes, decorative glass block accent windows, a GE appliance package, an intimate dining area, a living room with cozy fireplace and an open gourmet kitchen featuring custom-quality flooring, countertops and cabinetry. The owners' suite includes a luxurious master bath with dual-sink vanity (two- and three-bedroom floorplans only) and ample closet and storage space. Additional home features can include full-size washer and dryer connections. The garages, not offered in most condominium communities, provide storage space and valuable weather protection, and many offer direct access into the home. Lakecrest Condominium includes amenities that offer the ultimate in resident comfort. A cooperative climate enables homeowners to enjoy nearly year-round relaxation by the lake or one of the sparkling community pools. Residents and their guests can sip a cool drink on the outdoor pool deck or visit together in the private clubhouse, which includes a catering kitchen, separate restroom facilities, a state-of-the-art stereo system and an inviting hearth fireplace. Also housed in the clubhouse is the professionally staffed Lakecrest sales center. Lakecrest Condominium offers quick access to every local community convenience in the heart of Southside. It is just minutes from a wide variety of business, educational and recreational opportunities, as well as a diverse selection of restaurants, shopping and sports venues. Residents are near championship golf courses, beaches and vacation and day-trip destinations such as Daytona, Orlando, Amelia Island and historic Savannah. Call me to act on your behalf, as a buyers agent, at no charge to you. I will be happy to arrange a tour of these condos.